The hot Iberia promo we’ve all been talking about the last few weeks is still in limbo for many people. While the promotion was live, many questioned if it would be honored at all. Some avoided it as “too good to be true.” Others pushed the pedal to the metal and pushed a variety of ethical boundaries creating Avios accounts for their dogs and cats. 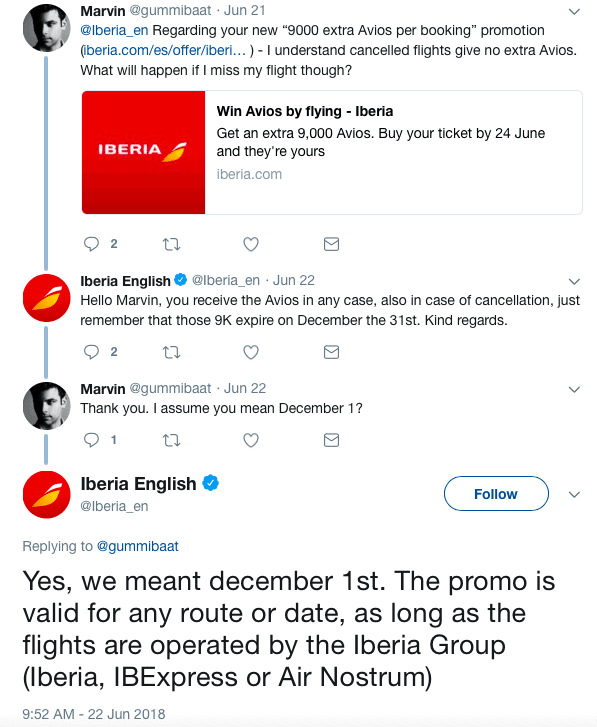 The tipping point for most, including myself, was when Iberia publicly confirmed on Twitter that one did not need to actually fly the purchased flights to be eligible for the Avios. In other words, the terms were clear. Purchase tickets, get 9,000 Avios per ticket up to 10 times. Right around the “10 day from ticketing” timeframe mentioned in the promotion, Iberia did go ahead and post the earned Avios into a great many Avios accounts. But far from all. Did not receive Avios: A majority (all?) of people with brand new accounts. There are many reports of emails going out stating that Iberia detected booking irregularities and therefore would not honor the promotion. The stated option was to ask for a refund of all tickets by July 31st. At least they are offering a refund, but for those that did everything according to the Terms and Conditions, it’s hardly a fair outcome. Some of these people were surely creating multiple accounts, etc. but many also appear to have played by the rules – simply with a new account. Most people in this category also had their accounts locked for review and unlocked after emailing in a copy of their passport. I’m not aware of any of these people having decisions overturned yet. Did not receive Avios: Those who were not in the locations specified by Iberia as being eligible (fair enough). Those in limbo: I’m in this category as is at least one of my readers. My account was not new, I booked exactly 10 one way tickets as defined by the promotion, my account lets me login fine, but I have no Avios. A phone agent said that my Avios number was not in any of my bookings. It’s very strange since when I login to the account all of the bookings are there. So they are “associated” with my account, but apparently they didn’t attach quite right to the tickets. I was told to email all of my tickets to Iberia to investigate and wait 7 days for a response. That’s frustrating as all of the people that already got their Avios have been able to book while our window to book with the Avios, if we get them at all, keeps shrinking. In short, it’s become kind of a mess. Lucky from One Mile at a Time has posted a few times in the last couple of days on this. He is sticking up for his readers that played by the rules. I pretty much agree with everything he wrote here. People relied on the terms of the offer, as stated in the promotion page, and the responses from the Twitter representatives. It was clear. You needed to buy a ticket (or up to 10) during the 3 dates the promotion was live and you would earn 9,000 Avios per ticket, up to 90,000. You do not have to fly the tickets. We also knew the rest of the terms, such as that you can’t transfer the Avios to BA and they expire if not used by December 1st, 2018. Was the promotion ill-conceived? Yes, it sure was. But the blogosphere gave them may chances to reneg early on by asking the pointed questions. Iberia remained enthusiastic through the 3 day booking window and didn’t even end it early. In short, Iberia needs to honor the promotion for those that played by the rules. Many of Lucky’s readers are trying to distinguish between those that bought plausible itineraries. Well, that’s BS. I don’t really care if you booked 10 one-way tickets on consecutive days or booked 5 one way and 5 the other. If you booked 10 inexpensive tickets, all to or from Madrid, there’s more than a 99% chance you aren’t flying it. The semantics of plausibility here died when the Twitter rep confirmed flying the flights were not a requirement. If you booked up to 10 flights, for yourself, on one account, Iberia should honor this. Anything less, when they have given the Avios to so many others, would simply be unfair and would justify any actions those wronged felt they wanted to pursue. I’m sure many will just take the refund, but I won’t be doing so if that is the offer to me. The main data point I’m looking for now is for someone that played by the rules and was officially denied by Iberia with the refund option to indicate they pushed back on that and got the Avios. I’m sure nobody wants to sue Iberia, so the way they handle pushback will be telling. What’s your status with this promotion? 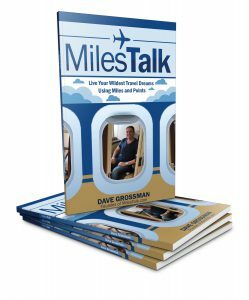 Please let me know here, on Twitter, or in the private MilesTalk Facebook group.